Contourite drifts are anomalously high sediment accumulations that form due to reworking by bottom currents. Due to the lack of a comprehensive contourite database, the link between vigorous bottom water activity and drift occurrence has yet to be demonstrated on a global scale. Using an eddy-resolving ocean model and a new georeferenced database of 267 contourites, we show that the global distribution of modern contourite drifts strongly depends on the configuration of the world’s most powerful bottom currents, many of which are associated with global meridional overturning circulation. Bathymetric obstacles frequently modify flow direction and intensity, imposing additional finer-scale control on drift occurrence. 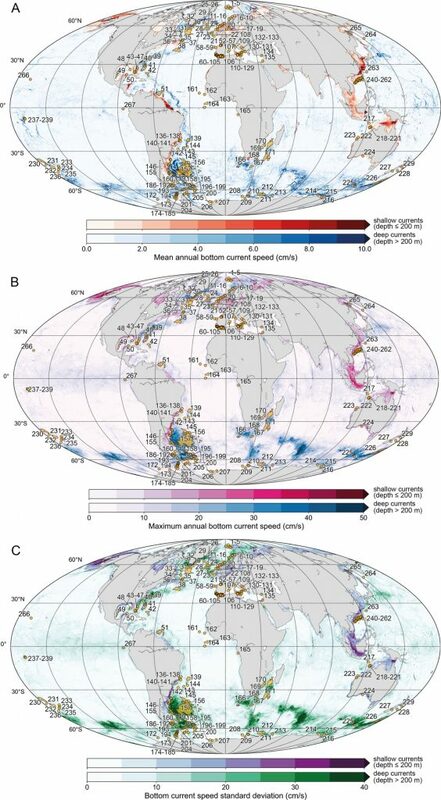 Mean bottom current speed over contourite-covered areas is only slightly higher (2.2 cm/s) than the rest of the global ocean (1.1 cm/s), falling below proposed thresholds deemed necessary to re-suspend and redistribute sediments (10–15 cm/s). However, currents fluctuate more frequently and intensely over areas with drifts, highlighting the role of intermittent, high-energy bottom current events in sediment erosion, transport, and subsequent drift accumulation. We identify eddies as a major driver of these bottom current fluctuations, and we find that simulated bottom eddykinetic energy is over three times higher in contourite-covered areas in comparison to the rest of the ocean. Our work supports previous hypotheses which suggest that contourite deposition predominantly occurs due to repeated acute events as opposed to continuous reworking under average-intensity background flow conditions. This suggests that the contourite record should be interpreted in terms of a bottom current’s susceptibility to experiencing periodic, high-speed current events. Our results also highlight the potential role of upper ocean dynamics in contourite sedimentation through its direct influence on deep eddy circulation. Fig. 1. Global distribution of modern contourite drifts overlying simulated mean annual (A), maximum annual (B), and annual standard deviation (C) for bottom current speeds. Smaller contourites are represented as points. Warmer colours are indicative of shallow (typically shelf-confined) bottom currents (depth ≤200 m) whereas cooler colours indicate deeper bottom currents (depth >200 m). Number labels correspond to the index given in Table S1 of contourite attributes. Molleweide projection. (For interpretation of the colours in the figure(s), the reader is referred to the web version of this article.) An interactive online version of the contourite polygons may be found at: portal.gplates.org/cesium/?view=contourites. The paper and related supplementary materials can be accessed by clicking here.